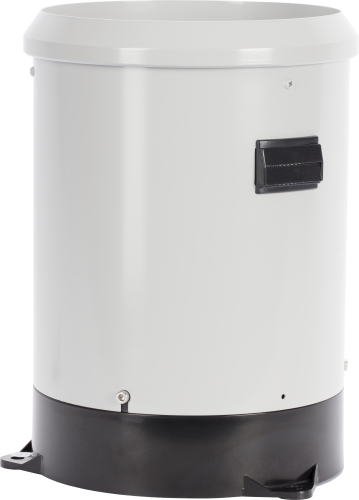 The TB4MM, manufactured by HS Hyquest Solutions, is a high-end tipping bucket rain gage that monitors rainfall in metric rather than US units. It has a 20.3 cm orifice and measures rainfall in 0.2 mm increments. The TB4MM is ideal for locations where intense rainfall events may occur. This tipping bucket is compatible with all Campbell Scientific data loggers, and it is used in environmental monitoring applications. The TB4MM funnels precipitation into a bucket mechanism that tips when filled to its calibrated level. Each tip is marked by a dual reed switch closure that is recorded by a data logger pulse count channel. After measurement, the water drains through two orifices (accepts 12 mm tubing) in the base, allowing the measured water to be collected in a separate container. The TB4MM contains an internal siphon mechanism that causes rain to flow at a steady rate to the tipping bucket mechanism (regardless of intensity). The siphon allows the sensor to make accurate measurements over a range of 0 to 50 cm per hour. Drain Tube Size Both filters accept 12 mm (0.47 in.) ID tubing. The base of the gage is supported by three legs. A CM240 Leveling Base and Mount or a user-supplied baseplate with leveling capability is recommended. The CM240 may be attached to a CM300-series mounting pole, or to a user-supplied 1.5 IPS (1.9-inch outer diameter, unthreaded) pipe (see Ordering Information). A concrete pad is recommended. Campbell Scientific offers the 260-953 Wind Screen to help minimize the affect of wind on the rain measurements. This wind screen consists of 32 leaves that hang freely and swing as the wind moves past them. If a data logger is not registering any tips, what can be done? Check that there is a solid connection to the reed switch. The screws should be tight, and the wires should have a solid connection to the screws. Try switching the connection from the current reed switch being used to the secondary reed switch connection. Check that the cable is connected to the correct input on the data logger. Take the two wires on the other end of the cable (the sensor side) and touch them together. The data logger should register a tip. If the tip registers, the issue is with the reed switch. Replace the reed switch. If the data logger still doesn't register a tip, try using a different cable. What are the indicators that a tipping bucket rain gage has a faulty reed switch? Not registering any tips, missing tips, or double tips. What can cause a data logger to not receive correct tipping data? The reed switch has failed. There is a faulty connection from the rain gage to the data logger, typically caused by a broken conductor or corroded wiring. What are the indicators that a tipping bucket rain gage is out of calibration? Not enough tips or too many tips. What type of wind screen can be used for a tipping bucket rain gage? The 260-953 Alter-type rain gage wind screen consists of 32 heavy metal leaves that hang freely and swing as the wind moves past them. The swinging leaves act as a wind damper and help minimize the effect of wind on the rain measurements without adding additional turbulence. When a rain gage is out of calibration, it is usually because of the buildup of dirt and grime on the internal surfaces of the tipping bucket mechanism. Cleaning the internal surfaces usually brings the rain gage back into calibration. It is also possible that a rain gage is out of calibration because it is no longer level. To minimize the possible occurrence of calibration errors, perform routine cleaning and maintenance of the rain gage at least once every three months. The environmental conditions at a particular site may require a facility to perform cleaning, leveling, and maintenance on a much more frequent schedule. What are the most common errors with a tipping bucket rain gage? The most common errors are either that the rain gage appears to have drifted out of calibration or that the tips are not being correctly recorded by the data logger.